Provide comfort for the family of Beverly Phillips with a meaningful gesture of sympathy. LEWISTON - Beverly Ann (Couras) Phillips, 77, of Monmouth passed away peacefully Sunday, Jan. 13, at Central Maine Medical Center with her loving family at her side. Beverly was born in Cambridge, MA., on September 20, 1941, daughter of the late Augustino and Belmira (Soares) Couras. Beverly was born and raised in Cambridge and Somerville, MA and graduated from Somerville High School in 1959. She worked for the Maine Department of Public Safety in Augusta, ME and previously for Bickford’s Woodworking and Curly’s Restaurant in Monmouth. Beverly was a devoted member of St. Francis Xavier Catholic Church in Winthrop, ME, where she was a Eucharistic Minister and delivered communion to local nursing homes and home bound parishioners. She was an adult advisor for the Catholic Youth Ministry, taught CCD (Sunday school), was a Cursillista living her weekend in 2009, a member of the Red Hat Society, Cushnoc Club, volunteered for the Special Olympics and faithfully played bingo with her bingo buddies several times a week. She is survived by her loving husband of nearly 56 years, Edward Stratton Phillips, Jr.; their three sons, Edward Phillips and his spouse, Ernesto Padro-Campos, of San Anselmo, CA, Robert Phillips and his wife, Jody, and daughter, Emily, of Sparta, WI., James Phillips and his partner Wendy Lausier of Greene and his daughters, Macey and Hannah Phillips of Wilton and their brother, Dalton Black, US Marines, Cherry Point, North Carolina and Harley Lausier, Willow Lausier and Sienna Lausier, her son-in-law, Chris Trenholm, of Monmouth, ME, and his three sons, Patrick Trenholm of Litchfield, Nathan Trenholm of Monmouth, and Nicholas Trenholm, currently, US Army at Fort Bragg, North Carolina. She is survived by her sister Rose Beaulieu of Hudson, MA and her brother Robert Couras of Somerville, MA. She is also survived by her many cousins, nieces and nephews. Beverly was predeceased by baby Anthony Phillips, daughter Dawn Marie Trenholm, son Thomas Edward Phillips, and sister, Patricia A. Pagluica. The family wishes to extend sincere thanks and gratitude to the doctors and nurses of the Central Maine Heart and Vascular Institute at CMMC in Lewiston for their extremely diligent and compassionate medical care. 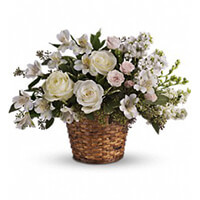 To send flowers in memory of Beverly Ann Phillips (Couras), please visit our Heartfelt Sympathies Store. The Westleigh Family sent flowers to the family of Beverly Ann Phillips (Couras). The Westleigh Family purchased the Love's Journey for the family of Beverly Phillips. I just want you to know that we are really sorry to hear about Beverly's Passing, she was a wonderful woman and was cherished by everyone who knew her. May she rest in peace.